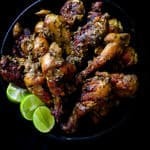 Deep fried spicy chicken drumsticks, rich with a spice blend of Asian flavors, no batter coat means the marinade has more time to soak into the meat. Chicken drumsticks marinated overnight with a rich blend of spices then fried and served hot is my kind of food to enjoy leisurely. Charred with crispy skin they are best served warm for maximum flavor. They give these deep-fried drumsticks a smoky taste with hints of cardamom, chilli, cinnamon, star anise from the spice mix. 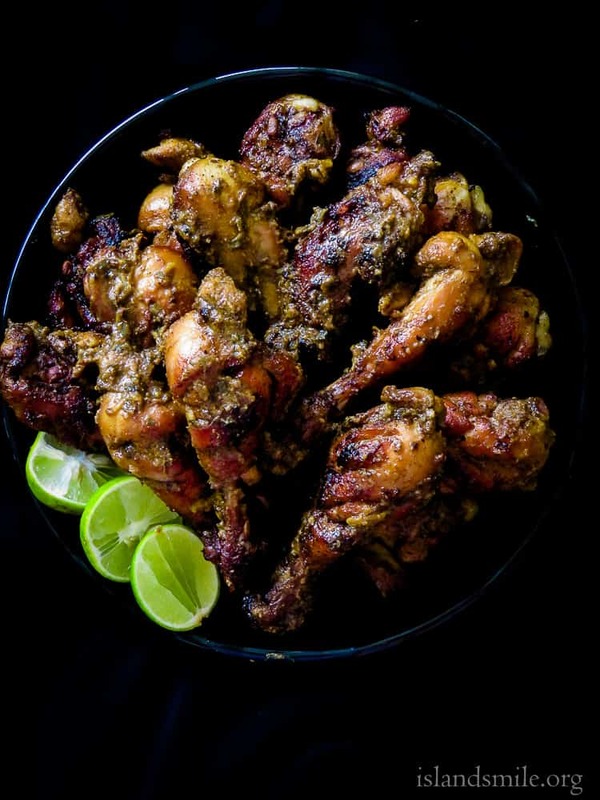 Add a drizzle of lime and a bit of cooked marinade over the drumsticks to make it lip-smacking good. So my chicken themed recipe for this week uses the Malaysian spice blend, I made in an earlier post. You can either marinate the drumsticks for a few hours or overnight. As I mentioned earlier, I try a different kind of dish with chicken as the main ingredient every week, if you are a new visitor to the blog, welcome! and please use the search button to find recipes based on chicken. For more recipes like this deep-fried Asian spiced drumsticks(no batter coated) . remember to subscribe to islandsmile food blog and get your fix and helpful recipes for your family delivered to your inbox. You can also find and follow me on Facebook, Twitter, Instagram and Pinterest. If you are hesitant to deep-fry the chicken drumsticks, do a healthy version by baking them instead of frying. It’s like the most problematic piece of meat of the chicken, don’t you agree? You definitely don’t want to have the insides still raw once the frying is done. When it comes to chicken drumsticks, usually, I avoid coating them or even frying them because I’m terrified of ending up with perfectly crispy skin outside and having certain parts of the flesh raw. especially towards the lower end of the drumsticks since they have tendons that need a really high temperature to fry. So, I have to ask you, do you have a no-fail way of cooking the perfect batter coated chicken drumsticks minus the raw spots? If you do then please let me know how you do it. Until then I’ll stick to deep-frying them. 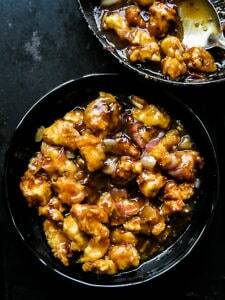 recipes to try- batter fried chicken in ginger sweet sauce. How I make sure my drumsticks are completely cooked through. Even deep-fried, I put my drumsticks through one more step for my peace of mind. I semi-cook them in a little water to make sure they are half-cooked. My stove top fire certainly doesn’t keep its heat steady or high enough to fry the drumsticks through(at least this is what I keep telling myself)keeping this in mind I semi-cook them for a few minutes as a precautionary measure. This doesn’t affect the taste of the fried drumsticks as you are only using a minimum amount of water and a few minutes to cook the chicken drumsticks. recipe- deep-fried Asian spiced chicken drumsticks(not batter coated). For the Malaysian spice blend, use the recipe below linked to the image. Once the Malaysian spice mix is prepared, separate three tablespoons of the spice blend from the marinade and save the rest in an airtight container. Add the Malaysian spice with ginger, garlic, shallots, cumin, curry leaves and salt into a grinder, blend well until all ingredients turn into a semi-wet paste. Wash, remove skin and clean the drumsticks well, place them on a flat surface and make deep sharp cuts to the flesh of the drumsticks. make the cuts deep enough to reach the bone. Transfer the Drumsticks to a large bowl and add the marinade to the bowl. check the marinade for taste, make sure the paste is well seasoned with Salt(not too salty please). Coat the marinade thoroughly over the chicken, especially on the deep cuts. Cover with cling film and place the bowl in the refrigerator for 2-3 hours or overnight. Once the chicken drumsticks are marinated, remove the bowl from the refrigerator, leave it out until the drumsticks reach room temperature. Preparing the chicken drumsticks to fry. Place a shallow, flat pan over medium heat and pour in the water, leave it to boil for 3 minutes. Once the water boils, reduce heat to medium and add the chicken drumsticks in batches of three, avoid crowding the pan. don’t throw away the marinade as you will be making a thick gravy with it. Allow 3-5 minutes for the chicken to cook, try not to constantly use the tong to move the drumsticks around but only to turn and cook all sides evenly. don’t over-cook the meat, just until they lose their pinkish tinge, immediately remove from pan. Place the cooked chicken in a dish and continue until you’ve semi-cooked all the chicken drumsticks. Deep Frying the chicken drumsticks. Place a deep large pan over medium heat, pour in the oil and let the oil heat, 300-350 if using a thermometer or place the bottom of a wooden spoon in the oil, if you see bubbles appearing around it then the oil is heated enough to fry the drumsticks. Maintain steady heat, fry the chicken, turning them every two to three minutes, so all sides fry to a deep golden color while the outer layer is slightly charred. make sure to fry them in small batches. Between 10-12 minutes at a steady temperature should be enough time to fry them. Place the fried drumsticks in paper towels to absorb extra oil. 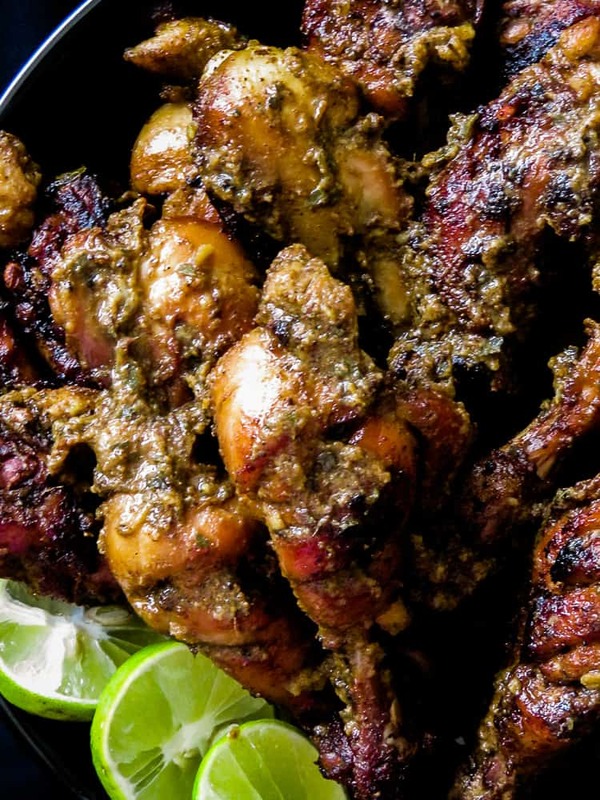 If you have any leftover marinade add a few tablespoons of Coconut milk, cook over medium heat and make a thick gravy of the marinade, once done pour it or toss the chicken drumsticks and serve immediately with wedges of lime to enhance the taste. DEEP-FRIED ASIAN SPICED DRUMSTICKS(NOT BATTER COATED). DEEP FRIED SPICY DRUMSTICKS, RICH WITH A SPICE BLEND OF ASIAN FLAVORS, NO BATTER COAT MEANS THE MARINADE HAS MORE TIME TO SOAK INTO THE MEAT. 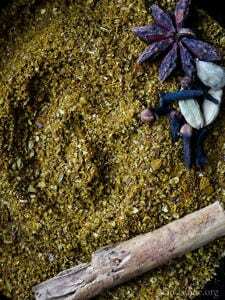 For the Malaysian spice blend, use the recipe link above . Once the Malaysian spice mix is prepared, separate three tablespoons of the spice blend from the marinade and save the rest in an air tight container. Transfer the Drumsticks into a large bowl and add the marinade to the bowl. check the marinade for taste, make sure the paste is well seasoned with Salt(not too salty please).